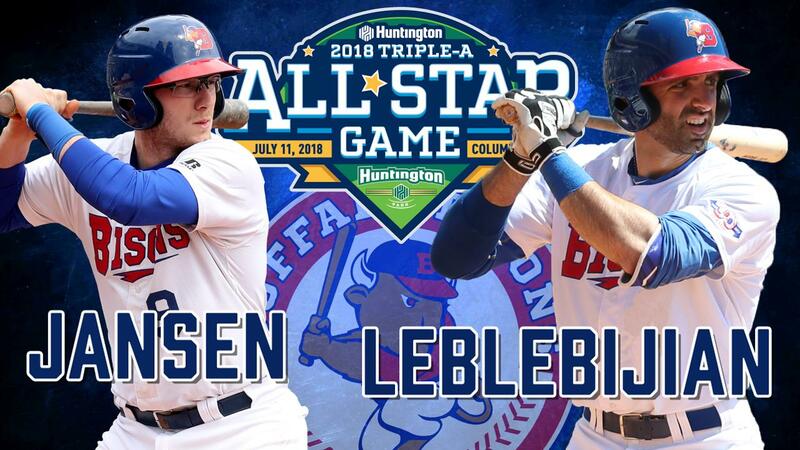 BUFFALO, N.Y. -- The International League today announced that Buffalo Bisons catcher Danny Jansen and third baseman Jason Leblebijian have been elected as starters for the International League All-Star Team at the 2018 Triple-A All-Star Game on Wednesday, July 11 from Huntington Park in Columbus, OH. 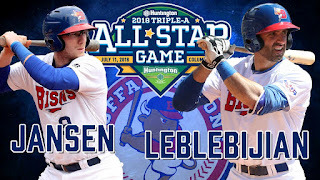 This is Jansen's first selection to a Triple-A All-Star Team while Leblebijian becomes just the third Bisons player in the modern era to be named to an All-Star team in consecutive seasons, joining Buffalo Baseball Hall of Famers, pitcher Dorn Taylor (1989-1990) and outfielder/designated hitter Ernie Young (2004-2005). Jansen, 23, leads the Bisons in average (.299, 9th in the International League), runs scored (30), doubles (17), extra-base hits (23) and RBI (39) in 57 games with the team. The backstop has also drawn 29 walks to only 30 strikeouts on the year, giving him the second-best on-base percentage (.413) in the International League. The Blue Jays' #6 prospect according to MLB.com also led all IL catchers in fan voting. Jansen had four hits on April 9 in Pawtucket, drove in five runs in a game on June 7 in Toledo and had a walk-off RBI-single to lead the Bisons to victory on May 4 against Syracuse. Last year, Jansen was named both a Florida State League (A) and Eastern League (AA) All-Star before his promotion to Bisons.